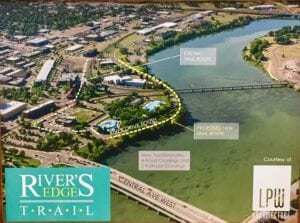 Plan showing new section of Rivers Edge Trail coming soon to downtown Great Falls! Here is our Top 19 for this week, celebrating work and successes to grow and strengthen the Great Falls regional economy. Great to be back in town for Easter after a 12 day Denver-LA-DC trip. Kudos to the raid warriors, remote workers, gig freelancers, and entrepreneurs who live through the headaches of business travel to support our economy. Great Falls is such an easy and pleasant airport to fly in and out of! 1) Hosted a prospect visit by a company looking at potential sites in our region for re-shoring its manufacturing. Like many companies, they were enticed overseas for manufacturing 20 years ago but the business climate has changed and now their business will benefit from being back in the US. If you know of any companies looking for new locations, give us a call so we can work with you to put together a competitive proposal! Jolene Schalper 406.750.4481. 2) Employment in the Great Falls MSA (Cascade County) increased by 112 in March, bringing our unemployment rate to 4.0%. This still leaves 1,521 local residents actively seeking work and another 800+ we can draw back into the labor force just to get our labor participation rate to the state average. So, let’s get going on those business startups and expansions! 3) Congratulations to the City of Shelby and the Carousel Rest Area on winning the Public/Private Collaboration Award at the Governor’s Tourism and Outdoor Recreation Conference! See Great Falls Tribune story. 4) Our monthly pre-business workshop, The LaunchPoint, saw its largest attendance since we began this training in 2015. With those 16 attendees, GFDA has now trained over 150 people in 2019. We’ve also now trained over 250 aspiring entrepreneurs with The LaunchPoint since 2015. Up next on GFDA’s Business Education Calendar, Profit Mastery, on April 24-25. Profit Mastery makes managing a company’s financials easier and simplifies how to plan for growth. Every advisor and entrepreneur we’ve guided through Profit Mastery sings its praises. Join us by registering here. 5) The Great Falls City Commission approved using downtown tax increment financing funds to make capital improvements to the City’s parking garages. See Tribune. And, check out this story about the new Elevation 3330 Public House downtown. The Children’s Museum of Montana in downtown Great Falls held a public meeting to get input on planning for its future new facility. See KRTV for details. 6) Join us as we celebrate our own Raegan Breeden, owner of Play N Learn Academy, along with many other exemplary small business owners at the Montana Small Business Administration Awards on Thursday, May 2nd at the Meadow Lark Country Club. Spots are filling up, so reserve your spot today by clicking HERE. Thank you to our Premier Sponsor Northwestern Energy and Supporting Sponsor Blue Cross Blue Shield of Montana for making this event possible. 7) We’d also like to invite our bank partners and economic developers in the state to a special Lender Training event in partnership with the U.S. Small Business Administration on May 1-2. This two-day course walks through the SBA 7(a) program, the SBA 504 program, USDA’s Rural Development programs, New Market Tax Credits, the Montana Board of Investments, and risk mitigation tools through the Montana Department of Commerce. Join us for the training and the SBA Awards ceremony. 8) MaltEurop’s Great Falls facility was featured in an article in Site Selection magazine about the globalization of malting barley. KFBB ran a nice story about Fresh Start Coop in Geraldine, click here. 10) SBA 504 interest rates were down yet again for April. The 25-year note came in at 4.527%, the 20-year note at 4.360% and the 20-year refi at 4.393%. The 10-year note funds every other month and came in at 4.616% in March. These interest rates are FIXED for the life of the loan and inclusive of all ongoing fees. In this interest rate environment it is hard to get a better deal. Add to that the SBA 504 program can get you a loan with a down payment as low as 10% and financing your commercial real estate or equipment purchases through with an SBA 504 loan becomes a no-brainer. If you’re curious about whether the SBA 504 program may work for you, please contact Mike Archer at 406-284-1789 or MArcher@GrowGreatFalls.org. 11) Housing is a critical component of our economic development strategy to grow and diversify the Great Falls regional economy while creating higher wage career opportunities. The Homebuilders Association of Great Falls is hosting David Logan, Lead Economist for the National Association of Home Builders, for a discussion of the impact of housing on Great Falls, a report titled Brick by Brick. Be sure to get this on your calendar for May 6 from 3-5 PM in The Portage Building at West Bank Landing, 405 3rd St NW – second floor across from GFDA. 12) THANK YOU to the Montana Legislature for passing House Bill 52 which reauthorizes many of the core economic development programs that we use to implement our regional economic development strategy. And, THANK YOU to the businesses who supported the legislative effort. The bill reauthorizes the Small Business Development Centers, Montana Manufacturing Extension Center, Food & Ag Development Centers, Growth Through Agriculture, the Export program at the Montana Department of Commerce, support of the Montana Cooperative Development Center, and others. 13) THANK YOU to the Montana Legislature for approving funding to expand the Dental Hygiene program at Great Falls College MSU! Now we need to raise local money to make the project a reality. Check out the details of this great project here. 14) The Legislature also named the fourth Saturday in July to be National Day of the Cowboy, see Giddyup in Tribune. 15) Is exporting part of your company’s revenue? Should it be? The Montana Department of Commerce will be hosting an Export 101 training at the Great Falls Area Chamber of Commerce on May 2nd from 2-4 PM. Exporting is an option to diversify revenue to stabilize through seasonal dips or when evaluating growth opportunities. Click here for more information. 16) Worked with a local small business helping them invoice on a project with the National Park Service. Assisted several businesses with their capability statements and elevator pitches in preparation for the upcoming GovMatch 2019 event in Billings this May. For more information on trainings, events and counseling in the government contracting area, contact Lillian Sunwall at LSunwall@GrowGreatFalls.org or (406)750-1253. 17) The second round of proposed Opportunity Zone regulations were released this week and we’re getting closer to having regulatory certainty around this new and exciting investment option. If you are looking to defer and reduce your capital gains by investing in an Opportunity Zone but aren’t sure what qualifies, or if your business or project is located in an Opportunity Zone and is seeking investment, please reach out to Mike Archer at 406-284-1789 or MArcher@GrowGreatFalls.org to discuss. 18) Networked with federal officials, financial leaders and Montana Congressional staff in Washington, DC. Spoke at the International Economic Development Council’s Federal Forum. Participated in the Council of Development Finance Agencies’ Federal Summit, in the Aspen Institute’s Opportunity Zone event, and the Fourth Economy’s Agents of Change event. 19) Thank you to this week’s Investor in Economic Development, the Cascade County Tavern Association, for their continued investment at the Community Division. When you invest in our community, not only are you helping us remain competitive, but you are ensuring that we adapt to the changing conditions involved in community development. Our dynamic team works hard to ensure that your investment dollars are utilized strategically and always with a growth mindset. If you want to further discuss how investment works, please contact Teresa Schreiner at 406.781.9499. We are HUNGRY to Grow the Great Falls regional economy, create higher wage jobs, build our tax base, improve our market competitiveness, and enhance the quality of life and economic opportunity for residents of Great Falls, Cascade County, and the entire 13-county Great Falls trade area. Connect with me on LinkedIn to network with the Great Falls region. Forward the GFDA Top 10 to friends and colleagues. You can join our distribution list HERE or text GFDA to 22828. The Montana Manufacturing Extension Center is looking for a Manufacturing Business Advisor to be based in Great Falls, working out of GFDA’s new office in West Bank Landing. See posting here. Are you bored? There is always something to do in Great Falls! Check out this week’s listing of things going on and get ready to experience our community. Want the list emailed directly to you? Sign-up to get this weekly event notice. Thank you Great Falls Tourism for putting this together! The Downtown Great Falls Association published an exciting Calendar of Events for 2019. The Montana Manufacturing Extension Center offers a great array of workshops and trainings for all sizes of manufacturing companies. SAVE THE DATE! Discover new opportunities for your business! The MT PTAC has invited over 25 federal, state, and local government agencies to participate in a matchmaking event on May 29th in Billings. The event is designed to facilitate introductions between business owners and government buyers with the intention of possibly doing business together in the future. Business owners will be able to visit with the various government buyers to discuss what products or services they provide, learn more about how the different agencies do business and find out about upcoming projects. If you are interested in seeing what government opportunities may be out there for your business, contact Lillian Sunwall at LSunwall@GrowGreatFalls.org or register for GovMatch 2019! To learn more or receive assistance with preparing your business for the event give Lillian a call (406) 750-1253 to set up an appointment. Flashback to the first train into the Great Falls AgriTech Park. We received the first reimbursement check from the City for the phase 1 and 2 infrastructure this month. Thank you to everyone who has worked so hard to make the rail industrial park a reality, Great Falls’ BNSF-certified Premier Park! Here is our Top 18 for this week, celebrating work and successes to grow and strengthen the Great Falls regional economy. 1) Great Falls was ranked 36th Best Small City for Business (out of the 162 cities with 50,000-250,000 population) by ChamberofCommerce.org. Cities were ranked by seven variables: regional price parities, job creation rates, per capita income, percentage of the young population with a Bachelor’s degree or above, the median earnings of 25+ year-olds with a Bachelor’s degree, unemployment rates and total sales figures/number of firms (combined into one variable). These were then averaged into one ranking. Plenty of room to keep climbing! 2) If you missed it, we published our GFDA Quarter Index 2019Q1. 3) We approved a $131,211 working capital loan for Vernon’s Quality Carpentry. Vernon’s Quality Carpentry is a long-time Great Falls business that offers finish carpentry services for primarily commercial and multi-unit housing projects across the state. They were awarded a number of contracts this spring for multi-unit housing projects in Great Falls, Butte and Billings and needed some working capital to help them expand. We’re excited to be able to help a Great Falls company continue to grow and bring money from elsewhere in the state back to Great Falls. 4) We also approved a $33,000 microloan for the Fresh Start Cooperative Association, a cooperative grocery store in Geraldine, MT, to purchase the building they are currently leasing. The Fresh Start Cooperative is an amazing story. The only grocery store in Geraldine was going to close so citizens of Geraldine and the surrounding area got together and formed a cooperative to buy it. They have had 151 people buy shares in the cooperative, which is especially impressive for a town with a population of 261. The share purchases have generated enough money for the co-op to buy the store and run it for the last two years. We love being able to help the rural communities in our trade region maintain these critical businesses and are very happy we were given the opportunity to help with Fresh Start. 5) GFDA is thrilled to be hosting this year’s Montana Small Business Administration Awards on Thursday, May 2nd at the Meadow Lark Country Club. One of our very own, Raegan Breeden, owner of Play N Learn Academy will be honored. This is a state-wide event so reserve your spot soon by clicking HERE. Thank you to our Premier Sponsor Northwestern Energy, and Supporting Sponsor Blue Cross Blue Shield of Montana for making this event possible. 6) Just prior to the SBA Awards, on May 1st and 2nd we are partnering with the Small Business Administration (SBA) to host a training event for commercial and economic development lenders. This two-day event will cover the SBA 7(a) loan guarantee program, SBA 504 loans, and other financing tools from the USDA, Montana Department of Commerce, New Market Tax Credits and the Montana Board of Investments. Register to join us here. 7) How do taxes in Great Falls compare to other Montana cities? 2nd lowest per capita, according to an article in the Missoulian. Great Falls collected $465 per capita, lower than $661 in Bozeman, $605 in Kalispell, $512 in Helena, and $479 in Missoula. We were slightly higher than the $451 in Billings. 8) Seats are filling up for our next pre-business workshop, The LaunchPoint. Help us spread the word about this no-cost workshop for early stage entrepreneurs. The next one is Wednesday, April 17th from 4-5 PM. Space is limited. Register to attend here. 9) Our Small Business Development Center (SBDC) client, Windrift Hill, has been awarded a $6,000 Montana Women’s Business Center Impact Grant. Mother-daughter team Amber Hofstad and Deena Maier were one of four companies in Montana, of the 71 applicants, to receive an award. The $6,000 award will be used to fund a reverse osmosis system as part of a new filling line at their skin care product manufacturing facility on Main Street in Conrad. Congratulations Amber and Deena! 10) The Montana Artrepreneur Program is seeking working Montana visual artists for its next cohort starting in the fall. This powerful college-level series of four weekend workshops demystifies the world of business for artists, reviewing 35 practical business tools. Registration deadline is May 15. Information and application at art.mt.gov/map, or contact mac@mt.gov or 406-444-6548. 11) Our next cash flow workshop, Profit Mastery is April 24-25. This class helps put financial management into a decision relevant format assisting entrepreneurs and advisors to business. Sixteen hours of continuing education credits are also available. Join us to improve your financial skills. Contact Jason for more info at JNitschke@GrowGreatFalls.org. 12) The Downtown Great Falls office, comprised of the Downtown Great Falls Association (DGFA) and the Great Falls Business Improvement District (BID), is hosting an Open House on Thursday, April 18 from 4-6 PM at their office located at 318 Central Avenue. They are celebrating one year in their new office and welcome the community to stop in and say hello! The BID is also celebrating the achievement of their 10-year renewal. Refreshments provided by Electric City Coffee and Mighty Mo Brewing Company. 13) USDA released data from the 2017 Census of Agriculture this week. The Census of Agriculture, taken only once every five years, looks at land use and ownership, operator characteristics, production practices, income, and expenditures. USDA data gives a sound picture of our agricultural sector and is the envy of many countries in the world for its independent accuracy. 14) Strategic Investment Grants up to $1,000 are available for professional artists, non-profit art organizations and art teachers (preschool – grade 12) in Montana. For guidelines and more information, visit art.mt.gov/sig, or contact Kristin Han Burgoyne at kburgoyne@mt.gov or 406-444-6449. 15) You expect us to know the programs, tools, deals, resources, and connections available to make projects happen. So we invest in our team! Each of us has professional development goals and objectives that enable us to grow the Great Falls Montana region. This week Brett became certified in Economic Gardening® and Jolene completed week three of four to become a certified Economic Development Finance Professional. 16) The City of Great Falls urges citizens and businesses to sign up for CodeRED, the city/county emergency notification system. Sign up at https://greatfallsmt.net/community/codered-emergency-notifications. 18) I’ve been invited to speak at the North Dakota Economic Development Conference in Mandan in June, and to give a presentation at the International Economic Development Council annual conference in Indianapolis in October. And, have been reappointed to serve another year as the lead Montana volunteer for the International Council of Shopping Centers, our professional network to reach commercial developers, brokers, and retailers. More opportunities to pitch the Great Falls region! The Great Falls Youth Job Fair will be held on Wednesday, April 17, 3:00-6:00 PM at the Paris Gibson Education Center. For more info, contact Becky Nelson at becky_nelson@gfps.k12.mt.us. Great Falls rank in Livability.com’s Best Places to Live: Top 100! An example of how we’re blending our business investment marketing of the Great Falls region with the visitor marketing undertaken by Great Falls Tourism. We used this graphic as the cover of a lead response this week. Check out Great Falls Tourism’s Top 27 things to do in Great Falls in April. Here is our Top 20 for this week, celebrating work and successes to grow and strengthen the Great Falls regional economy. Watch for our Quarter Index coming soon. 1) Congratulations to David and Zachary Kelman on opening Great Falls Coins & More downtown at 508 1st Avenue North. See Great Falls Tribune. Brandon Cartwright, Joe Anderegg and Trever Ziegler have scheduled the grand opening of Elevation 3300 on April 12th. The new downtown public house is in the second story of Four Ten Central (the historic Strain Building). See TheElectricGF.com. 2) Networked with economic developers, and business and community leaders, at the Alberta Economic Development annual conference in Banff. Enjoyed three speaking opportunities to talk about Montana. Thank you to Great Falls Tourism for putting together a gift basket for their silent auction! 4) Fourteen entrepreneurs from across Montana participated in our fourth webinar of 2019, Reach Customers Online with Google. To view any of the 16 webinars GFDA has produced over the last three years, click here. Up next on the GFDA Business Education Calendar is The LaunchPoint: A Pre-Business Workshop on Wednesday, April 17th from 4-5pm. This workshop walks through best practices and primary elements of business ownership for entrepreneurs in the planning or early stages. To attend, please reserve your seat here. 5) It’s time to move forward with improvements to the Gore Hill – Interstate 15 intersection! Make your voice heard at a public open house being held by the Montana Department of Transportation from 4-7 PM on April 25 at Crystal Inn Hotel and Suites. See TheElectricGF.com for details. 6) The Great Falls Tribune ran a wonderful story about this year’s The Fire Within event. 7) Congratulations to Great Falls Public Schools for its outstanding commitment to music education with a Best Communities for Music Education designation for the 8th year in a row! GFPS joins 623 districts across the country in receiving the prestigious distinction in 2019 from the NAMM Foundation. 8) The owners of Hybrid Steel Design in Geraldine, a new GFDA investor, attended a private session of our cash flow and profitability workshop, Profit Mastery. Ashley Clark, Chief Financial Officer at Hybrid Steel Design, says of Profit Mastery: “This course will be an invaluable tool to help us understand our cost structure, allowing us to have a more efficient cash flow and understanding of our future growth.” The next public session of Profit Mastery is April 24-25. Cost of the two-day course is $145. It’s open to entrepreneurs, business advisors, economic development professionals, accountants, and lenders. 9) Downtown Great Falls is getting national recognition. Joan Redeen of the Business Improvement District and Kellie Pierce of the Downtown Great Falls Association gave a presentation on downtown outdoor dining (pedlet) efforts at the National Main Street conference in Seattle. Nice work! 10) The Community Development Financial Institutions (CDFI) Fund, part of the US Treasury, released their Notice of Funds Availability this week. GFDA has been successful at obtaining grants from the CDFI fund in the past, having won four financial assistance awards since 2012, including awards in each of the last two years. We are currently in the process of writing a grant application for this year’s award and every dollar of local investment we receive increases the amount of grant funding we can request. If you would like to make an investment in GFDA, now is the time to act. Please contact Teresa Schreiner at 406-781-9499 or TSchreiner@GrowGreatFalls.org to make your investment today! 11) Event Marketing Grants are now available from the Montana Department of Commerce. If you have ever wanted to start a River Fest, Heritage Festival, Mural Festival, Dam Triathlon, Multi-Day Music Festival, Endurance Race, Makers Festival or any other large scale event – now is the time! 12) We are partnering with Livability Media in an opportunity to reach 11 million digitally, social media promotions, print magazine distribution, digital version of magazine to share in email/link/social media. This is part of our digital market efforts to promote Great Falls as a great location to live and work, building on the Great Falls Area Chamber’s efforts. Rachel Preston is working here on behalf of Livability Media to offer GFDA Investors the chance to take part in this talent attraction advertising opportunity. You can reach her at greatfalls@livmedia.com. 13) The U.S. House passed a bill to federally recognize the Little Shell Tribe of Chippewa Indians. Hopefully, this time our Montana Congressional delegation can get it all the way through! See KRTV. 14) We are constantly pitching our region to companies, developers, entrepreneurs, media, prospective talent, and residents. We are proud of our history as a former copper smelting town that harvested the power of the Missouri River to drive early development. Today we are home to a leading Alzheimer’s research facility, a growing medical hub, and entrepreneurs pushing the bounds of what it means to live and work in Rural America. North Central Montana’s forward leaning push welcoming innovation is where doers can untame their entrepreneurial spirit. Help us share this powerful message. Please share the Top Ten through your LinkedIn, Facebook, and Twitter! Each week we post it on our new website check it out. 15) Great Falls Original Farmers Market is holding a Spring Craft Fair on Saturday, April 13 in the Mansfield Convention Center. 16) Hosted our first Development Coffee in our new space this week. Wonderful conversation and in case you missed it- mark your calendar for next month, May 3rd at the GFDA office at 7 AM. 17) Does your business hold a government contract? Do you know what your requirements are for cybersecurity? Does that word confusion or concern you? Then your business may be interested in the following Cybersecurity Workshop. Northrop Grumman, in collaboration with the USC Center for Economic Development, is offering free cybersecurity training to small businesses through an Air Force Small Business Office Mentor Protégé Program. This workshop is open to all small businesses. Advance registration is required. The workshop will be held Tuesday, July 2, 2019 from 8:00 AM to 5:00 PM in Bozeman. Here is the link to register. If you have any questions, contact Lillian Sunwall at LSunwall@GrowGreatFalls.org or call (406) 750-1253. 18) U.S. Customs and Border protection is holding Global Entry Enrollment workshops in Great Falls. See press release for more info. 19) Thanks to this week’s Investors in Economic Development, K&K Trucking and Liberty Electric for your Community Division investments. Your investments allow us to continue economic growth and spur diversification in our thirteen area trade economy. We know that your investment translates into an economic multiplier of enhancing projects for riverfront and downtown revitalization, entrepreneurial assistance, and business development. As we say, great things continue to happen through sweat equity but we are nowhere near satisfied; so let’s continue to Grow Great Falls! For more information about investment, contact Teresa Schreiner at 406.781.9499. 20) The Great Falls Children’s Museum is seeking public comment immediately on their new building. They want to hear from the community how the new facility can best serve the community, their families and our state. The meeting is scheduled for April 16th at 5:30 PM at the museum. They are accepting comments by mail and email up until May 15, 2019. For any questions or concerns please call 406-452-6661or email to museuminfo.cmom@gmail.com. The Downtown Great Falls Association and the Business Improvement District announced a new logo to promote Downtown Great Falls. We now have tourism, economic development, the Chamber’s talent recruitment effort, and downtown using the same brand logo, progress for Team Great Falls! Here is our Top 20 for the last two weeks, celebrating work and successes to grow and strengthen the Great Falls regional economy. Sorry to fall so far behind. I promise to add more information about our regional economy in next weekend’s Top 10. Early tomorrow, I’m headed back up to Alberta to meet with companies and speak at the Economic Developers Alberta annual conference. 1) Congratulations to the C.M. Russell Museum, Great Falls Tourism and all those involved in Western Art Week! 2) Ace Hardware opened its new store on 10th Avenue South. Town Pump started construction on expansion of their facility on 10th Avenue South. The City Planning Advisory Board approved BeeHive Homes’ plans to build two new 18-bed assisted living facilities in Great Falls. 3) The Great Falls metro area (Cascade County) added 617 jobs from February 2018 to February 2019, according to employment data released by the Montana Department of Labor & Industry. As importantly, our labor force grew by 598 people. Our labor force participation rate is still two points below the state average, which means we have the capability to add significantly to our labor force as we continue to create more higher wage career opportunities. 4) How do we stand out among 383 metropolitan statistical areas across the United States, many very similar to us? We build relationships and tell our story! We did that at the annual Site Selector Guild Conference in Salt Lake City. We built relationships and gained insight from site selectors that we hope gives us the edge. To chat about GFDA’s Business Development efforts, call Jolene at 406.750.4481. 5) The University of Providence opened its new Medical Assistant Program, see KFBB story. 6) High Plains Financial, our SBA lending affiliate, closed a $1.372 million SBA 504 loan on a $4.5 million purchase of the Super 8 Hotel in Butte this week. We also funded a $212,000 SBA 504 loan for a $585,000 equipment purchase for a family owned Great Falls business last week. As construction season begins to ramp up, please get in touch to find out how we can finance your commercial real estate or equipment purchases with as little as 10% down and low, fixed interest rates for up to 25 years. 7) Congratulations to the Homebuilders of Great Falls and all those involved in the 36th Annual Great Falls Home & Garden Show! 9) Institute of Tourism and Recreation Research has completed their city level non-resident visitation data and Great Falls saw 1.03 million overnight visitors in 2018, a 15% increase over 2017! 10) Investors and potential investors: don’t forget to attend Development Coffee this Friday, April 5th, at our new office in The Portage Building in West Bank Landing. Join for refreshments and development-driven conversation at 7am at 405 3rd St NW, #203, Great Falls, MT 59404. 11) Began underwriting two loans, both for woman owned businesses. One of the loans is for a business looking to move into town and the other is a long-time Great Falls based business that needs some working capital to support all of its growth. If your business is looking to start, grow or expand we have loans and resources to address almost every need. Please contact Mike Archer at 406-284-1789 or MArcher@GrowGreatFalls.org to find out we can help. 12) Congratulations to Rebecca Engum, Executive Director of Great Falls Tourism, on having her article, “Capitalizing on Outdoor Recreation,” in the Economic Development Journal published by the International Economic Development Council! 13) Looking for more prospects in government contracting? A rare opportunity has opened up for small businesses that are members of the following socio-economic programs; HUBZone, Woman-Owned-Small-Business and 8(a). The U.S. Army Corps of Engineers Small Business Professional for the Omaha District (which represents MT) has reached out to the PTAC offices. They want to see if we know of businesses that would benefit from a meeting that would allow them to “pitch” their company. Each contractor is given a 1 hour time (1 on 1) slot to discuss capabilities and past performance, whatever time remains is left for questions and answers. So far it has been a HUGE success. If you think this is a fit for your small business, give Lillian Sunwall a call at (406) 750-1253 or email her at LSunwall@GrowGreatFalls.org. 14) GFDA was awarded funds for its pulse market organization efforts at the Montana Pulse Crop Committee’s meeting on Tuesday in Bozeman. The awarded funds will help support outreach efforts to engage international and domestic actors to support and invest in a Pulse Crop Quality and Innovation Council (PQIC) to be formed later this year by GFDA. 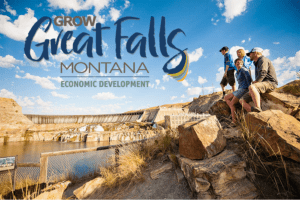 For more information about the innovative work being carried out by GFDA to enhance economic opportunities for Montana’s agricultural sector, contact Barnett at 406-750-3285 and Barnett@GrowGreatFalls.org. 15) Met with a property owner who had questions on remediation of potential hazardous substances in their building. The property owner had not obtain a Phase 1 Assessment prior to purchase and didn’t qualify for EPA Assessment funding. If you are looking to buy an older building or a property, give us a call to see how we can assist with environmental investigation prior to purchase. For more information, contact Lillian Sunwall at LSunwall@GrowGreatFalls.org or (406) 750-1253. 16) Congratulations to the Choteau Education Foundation for its successful second annual fundraiser held on March 15th. The Choteau Pub Trivia Night filled the Choteau Stage Stop Inn’s event space with teams all vying to win the coveted tital of trivia champ. Choteau businesses and community members supported the event with donations as did many businessss in Great Falls and the surrounding trade area. The annual event raised in excess of $10,000 to support the CEF. 17) Roger Sammons, owner of Pardue Grain in Cut Bank, joined Jason and Tyler at the 3rd Annual #SBDCDay event at the new Montana Craft Malt facility in Butte. #SBDCDay is a nationwide marketing event, started here in Montana, designed to raise the profile of the SBA’s Small Business Development Center (SBDC) program which provides entrepreneurs no-cost counseling and training to help businesses start and grow. Thirty people from around the state, including four business owners, Lieutenant Governor Mike Cooney, and the new Director of the Department of Commerce Tara Rice attended. Search #SBDCDay on your social media platforms to find images and videos from the Montana event as well as other events around the US. If you could use an impartial third party look at your business, contact Jason at JNitschke@GrowGreatFalls.org or Tyler at TMenzel@GrowGreatFalls.org. 18) Teton County is working hard to confront and resolve substance abuse and mental health issues affecting the county through its Teton County Addictions Task Force established in October 2017. The Task Force has issued a new report outlining the issues and a community readiness assessment conducted as part of a meeting attended by 47 community members on January 29th. The next Task Force meeting will be held on Tuesday, April 16th from 10 a.m. to Noon at the Teton County Annex in Choteau and all are welcome to attend. 19) Networked and exhibited at the Montana Manufacturing & International Trade Day event in Helena. 20) Thanks to this weeks’ Investors in Economic Development, LPW, Inc., and North 40 Outfitters for their investment at the Leadership Division, and Water and Environmental Technologies and Stewart Title, for your investments at the Community Division. Your investment in our community demonstrates your commitment to growing area wages, opportunities, and overall quality of life. To discuss investment in Great Falls and our 13 area trade economy, contact Teresa Schreiner at 406.781.9499. Great Falls Tourism has a great career opening for a Content and Social Media Director. Contact Rebecca Engum at Rebecca@VisitGreatFalls.org. Congratulations to Raegen Breeden, owner of Play N Learn Academy, on being named Montana Woman-Owned Business of 2019 by the U.S. Small Business Administration’s Montana District Office! Here is our Top 10 for last week, celebrating work and successes to grow and strengthen the Great Falls regional economy. 1) Celebrated with Scheels and other community partners the raising of $250,000 toward the rerouting of the River’s Edge Trail along the Missouri River from Broadwater Bay to the 1st Avenue North Bridge area. The new route will replace the current trail which makes its way behind the police department, water park and across two active rail lines. See the story on The Electric here. 2) LPW Architecture released the fly around video of the new Longfellow Elementary School! This is a very exciting project for our community! Check it out here. 3) Spots are filling up for the 9th Annual The Fire Within, March 28th at the Meadow Lark Country Club starting at 5:30 PM. Join us as we celebrate two incredible female entrepreneurs: Aspire Winner Susan Crocker (The Good Wood Guys) and Inspire Winner Kari Lane Johnson (My Viola Floral Studio). Admission is free thanks to the sponsorship of Embark Credit Union, but you must register to reserve your seat. Guarantee yourself a spot and register today! 4) Congratulations to the 2019 KRTV Five Under 35: Rebecca Hannant, Hillary Shepherd, Thomas Risberg, Ashley Romeo, and Scott Reasoner! These five were chosen from a pool of 60 nominees. They represent diverse professionals that chose to move here, grew up here, and diverse industries. Shannon Newth asked the winners two questions, what does Great Falls have going for it, and how can Great Falls improve? Click here to check out their answers. 5) GFDA’s Food and Ag Development Center Director Barnett Sporkin-Morrison participated in the University of Wisconsin’s Food Finance Institute Level II training this week. Understanding the current marketplace and the economics behind scaling up a local, regional, or national brand can be tricky at times. If you have an existing brand or are a new entrepreneur looking to attack the market, Barnett can help you reach your goals as part of GFDA’s team approach to economic development. Barnett can be reached at 406-750-3285 and Barnett@GrowGreatFalls.org. 6) We saw a record crowd at our first QuickBooks class of 2019. 18 people attended. Thank you to GFDA investor Wendy Weissman CPA PC for presenting our QuickBooks class. Up next on GFDA’s Business Education Calendar is a webinar, Reach Customers Online with Google, scheduled for Thursday, April 4th from 11-11:30 AM. 7) SBA 504 interest rates came in below 5% again for the March debenture sale. The 25-year rates came in at 4.737%, 20-year at 4.581%, 20-year refi at 4.614% and 10-year at 4.616%. These rates are fixed for the life of the loan and include all on-going fees. The SBA is releasing a new SOP effective April 1st which will make eligible the use of the SBA 504 program for businesses that grow, produce, process, distribute or sell products made from hemp (as defined in section 297A of the Agricultural Marketing Act of 1946). If you’ve been thinking about starting a new hemp rope factory but have had trouble finding the financing please get in touch with Mike Archer at 406-284-1789 or MArcher@GrowGreatFalls.org to find out how we may be able to help. 8) Networked with investors at the National Opportunity Zone Summit in Denver and participated in the Colorado Impact Days event. Met with the Colorado Department of Economic Development to learn about their rural co-working space initiative and with the Economic Development Administration to discuss future projects to benefit the Great Falls trade area. 9) Great Falls Tourism has a great career opening for a Content and Social Media Director. Contact Rebecca Engum at Rebecca@VisitGreatFalls.org. 10) Recognizing GFDA’s work in the development of the river front and our shared vision of doing good in the community, Scheels joined the ranks as our newest Leadership Division investor during their River’s Edge Trail Celebration Breakfast. We’d also like to thank this week’s Investors in Economic Development, BNSF for their Leadership Division investment, Geranios Enterprise, Inc. and Douglas Wilson & Co. for their Pacesetter Division investments. Your investments allow our team to facilitate projects that not only push for projects that create opportunities for high wage jobs and diversification, but they improve our overall quality of life. Keeping in theme with one of our key strategic priorities, your investments encourage opportunities downtown riverfront improvement. If you have questions about investment, please contact Teresa Schreiner at 406.781.9499. GFDA is looking for investors, potential investors, developers, officials, and entrepreneurs to join us on our Annual Aspirational Tour May 8-10. We will explore information technology and riverfront developments, and other economic development efforts, in Missoula, Coeur d’Alene and Spokane. Join us as we obtain inspiration, visiting with stakeholders, developers and/or burgeoning industries for potential capital enhancements in Great Falls. As you may have heard us say, we are nowhere near satisfied. If you feel the same and you have an appetite for learning more, contact Teresa Schreiner at TSchreiner@GrowGreatFalls.org or 406.781.9499. Congratulations to our 2019 The Fire Within Inspire award winner, Kari Lane Johnson of My Viola, and Aspire award winner, Susan Crocker of The Good Wood Guys! THANK YOU to Embark Credit Union for sponsoring this great celebration of women entrepreneurs! Here is our Top 16 for this week, celebrating work and successes to grow and strengthen the Great Falls regional economy. Every industry is important in the Great Falls economy. We support and love them all, because we appreciate and NEED every single one! Read on to see some surprising facts about the housing industry in our MSA. 1) Great Falls has been named as one of the top 100 Best Places to Live by Livability.com! “The cities on this year’s list represent the best of the best when it comes to affordability and opportunity,” says Editor-in-Chief Winona Dimeo-Ediger. “These 100 cities are not just fantastic places to live in terms of their amenities, education, health care, and infrastructure, they are places where young people can build amazing careers and communities.” More than 1,000 millennials across the country were surveyed regarding what matters most to them when making relocation decisions and the number one and two answers: affordability and job opportunities. 2) Join us for The Fire Within on March 28th as we celebrate two exceptional female entrepreneurs: Our Aspire Winner Susan Crocker (The Good Wood Guys), and Inspire Winner Kari Lane Johnson (My Viola Floral Studio). The festivities take place at the Meadow Lark Country Club starting at 5:30 PM. Admission is free thanks to the sponsorship of Embark Credit Union, but make sure you reserve your seat and REGISTER TODAY. 3) Congratulations Michelle Belknap, President/CEO, Easterseals-Goodwill on receiving the J.D. Robins Jr. Distinguished Career Award at Goodwill Industries International (GII) Conference of Executives. We are proud to be home to your regional headquarters! 4) Barnett was out in Anaheim this week for the Natural Products Expo West trade show. While there he gained knowledge of new natural food trends, talked with influencers, and expanded GFDA’s network in the space. Overall Barnett found there’s significant room for new, innovative products and is eager to work with existing companies and new entrepreneurs who can build brands that connect consumers with Montana. Barnett can be reach at 406-750-3285 and Barnett@GrowGreatFalls.org. 5) Bob Quinn, president and founder of Quinn Farm & Ranch and Kamut International in Big Sandy released his first book: Grain by Grain: A Quest to Revive Ancient Wheat, Rural Jobs & Healthy Food. Congratulations Bob! 6) The SBA approved a $374,000 SBA 504 loan as part of a $905,000 purchase of commercial real estate in Bozeman for Anderson’s Masonry Hearth and Home! This new real estate will house Anderson Masonry’s newest acquisition, Bare’s Stove and Spa. Thanks to the great and proactive work of their banker, Ben Haag, of First Interstate Bank in Kalispell, Anderson Masonry will now get to enjoy low, fixed interest rates on the SBA portion of their loan for 25 years and will only have to provide a down payment of 10%. With the low down payment the company will be able to complete some renovations as well as maintain the working capital, which is so important for growing businesses. If your business needs money to grow please contact Mike Archer at 406-284-1789 or MArcher@GrowGreatFalls.org to find out how we can help. 7) The Great Falls Original Farmers’ Market will be expanding down Central Avenue this summer and will hold a Spring Craft Fair on April 13th in the downtown Mansfield Convention Center. 8) Fifteen entrepreneurs from around the state participated in our March webinar, Finding Customers on Instagram. GFDA has now trained over 100 people in seven events in 2019. Up next, our pre-business workshop for aspiring entrepreneurs, The LaunchPoint on Wednesday, March 13th from 4-5 PM. We’ve also expanded our seating to 20 for QuickBooks on Friday, March 15th. Act quickly to get one of the last seats. Contact Jason with any questions about GFDA’s Business Education Calendar. 9) Montana has the 13th lowest tax burden amongst U.S. states according to an analysis by 24/7 Wall Street. See article on USA Today. 10) Great Falls Tourism has a great career opening for a Content and Social Media Director. Contact Rebecca Engum at Rebecca@VisitGreatFalls.org. 11) Existing Business expansion will account for the majority of our economic growth this year. More growth could happen if more businesses knew about the professional tools and services provided free of charge to help them. Contact Jolene to learn more about our services for existing businesses, 406.750.4481. 12) The Great Falls Youth Job Fair will be held on Wednesday, April 17, 3:00-6:00 PM at the Paris Gibson Education Center. For more info, contact Becky Nelson at becky_nelson@gfps.k12.mt.us. 13) We are working on a set of short videos to promote our region. Our focus is why businesses and entrepreneurs choose to locate and thrive in the Golden Triangle region of North Central Montana. We want to showcase how business gets done AND the outstanding quality of life you enjoyed. If you want to share your story or know someone we should reach out to, contact Tyler at TMenzel@GrowGreatFalls.org. 14) Congratulations to Lillian Sunwall, GFDA Vice President, on earning recognition as a Certified Procurement Professional from the Association of Procurement Technical Assistance Centers! 16) Thank you to this week’s Investors In Economic Development, the Home Builder’s Association of Great Falls and Hybrid Steel and Design, for their Community Division investments. As you know, your financial investment goes directly into assisting our team as we work to leverage capital intensive projects, work with existing businesses that wish to expand or provide coaching to others regarding retention, assist others that may need business loans, from larger projects or budding entrepreneurs. We appreciate your investment to grow our regional economy. Let’s continue the momentum to grow Great Falls. If you have questions or want to talk further about investment, please call Teresa Schreiner at 406.781.9499. The annual Gross Domestic Product (GDP) of the Great Falls MSA economy (Cascade County) is estimated by JobsEQ to be $3.147 billion in 2017. Guess which industry sector contributes the second largest portion of GDP after Health Are and Social Assistance. Yep, its Real Estate and Rental and Leasing with an estimated annual GDP contribution of $352 million. Residential real estate accounts directly for 1,357 local jobs last quarter. So hat’s off to the residential builders, framers, masons, roofers, siders, plumbers, and electricians, plus the installers of foundations, glass, flooring, drywall, tile, and carpentry. And, don’t forget the real estate brokers lessors, appraisers and property managers. In addition to those 1,357 jobs, let’s hear it for residential mortgage lenders and brokers, insurance agents, escrow agents, landscapers, site contractors, road and utility installers, nurseries, lumber yards and home improvement stores, and everyone else involved in the housing industry! Did you know that our homeowner vacancy rate is 24% lower than the state and national averages? [According to JobsEQ] Yep, we need more housing. Have a great and prosperous week! What the next revolution in education and workforce training will bring: ??? Here is our Top 10 for the last three weeks, celebrating work and successes to grow and strengthen the Great Falls regional economy. Sorry this is so late in getting out. We’ve been busy working with clients on exciting new projects and moving into our new office! Our mailing address has stayed the same: P.O. Box 949, Great Falls, MT 59403. Our new physical office address is The Portage Building at West Bank Landing, 405 3rd Street NW, Suite 203, Great Falls, MT 59404. 1) Hosted 200 business leaders for the annual IGNITE Great Falls 2019! The event featured many of the projects that will start or open in 2019. This year we had 17 projects presented and several major announcements! Get ready for a new TOY Store downtown! Nicole and Lee Weigand, Downtown Dice and Games (514 Central Avenue), announced they are excited to bring a new, locally owned and operated toy store to downtown Great Falls. Watch for their new name and logo soon. Dry aged meat, custom sausages, bacon varieties can be hard to find here in the Golden Triangle. Drew Hicks is going to change that with the announcement of his new Central Avenue Meats craft butcher shop in downtown Great Falls, 420-422 Central Avenue, see KRTV. For more about the Ignite event announcements, see Great Falls Tribune. 2) Veggie burgers and many other alternative proteins use ingredients grown in the Golden Triangle. Barnett was a featured speaker, talking about processing opportunities in the our region, at the inaugural Alternative Protein Show in San Francisco. Four hundred venture capitalists, entrepreneurs, and established companies came together to discuss innovative and opportunities. To learn more, contact Barnett at 406.750.3285. 3) The newly expanded Play N Learn Academy opened Monday, January 14th on the east side of Great Falls. This 130 student preschool and daycare provides much needed high quality daycare center for families. It has also created 11 new jobs. GFDA has been working on this project since January 2015. Congratulations to Raegen Breeden and her team! They are enrolling now at 4241 2nd Avenue North. 4) Nominations are now OPEN for the 9th Annual Fire Within Awards sponsored by Embark Credit Union! We recognize two types of women entrepreneurs, those who have been in business under five years with strong business sense and drive, the Aspire Award, and women who have been in business over five years, have strong business acumen, and mentor others, the Inspire Award. Nominations are due by February 1, 2019. Click here for the nomination form. Don’t forget to put the even on your calendar March 28, 5:30 – 9:00 PM at the Meadowlark Country Club. 5) Benefis Health System opened the final phase of its Emergency Department expansion, see Great Falls Tribune. Fetch Pet Boutique and Planet Fitness opened. Canyonville Golf Club announced it will locate downtown at 410 Central, see TheElectricGF.com. The VA announced it will expand its Great Falls clinic. 6) Mike traveled to Missoula and Kalispell to visit businesses who have taken advantage of SBA 504 loans with us, and to visit with loan officers and brokers about the very low, fixed interest rates SBA 504 loans can provide for their borrowers and buyers. Interest rates for the January debenture sale came in below 5% for the second month in a row, and down from the December rates by 10-20 basis points. Rates for the January sale were: 25-year: 4.877%; 20-year: 4.751%; 20-year REFI: 4.784%; 10-year: 4.647%. These rates are fixed for the life of the loan and include all on-going fees. If your business is in the market for new commercial real estate or equipment and would enjoy fixed interest rates like those above, as well as down payments as low as 10% please contact Mike Archer at 406-284-1789 or MArcher@GFdevelopment.org. 7) Two of our partners won grants from the Montana Department of Commerce that will help our 2019 economic development efforts. Great Falls Tourism won an $8,000 grant to shoot videos of unique Great Falls businesses. We’re providing a match and will shoot more videos of a wide variety of Great Falls entrepreneurs and businesses to use in our business and talent attraction marketing. The Downtown Development Partnership, in conjunction with the City of Great Falls, won a $20,000 grant that we will use to create redevelopment visions for targeted downtown blocks and intersections. We’ll use the visions to help attract private investment in real estate and new businesses. 8) Worked with three potential AgriTech Park prospects, one transload, one construction materials, and one agri-processor. We use the AgriTech Park as a tool to attract businesses to our region. At the end of the day, we don’t care where they end up as long as it’s in the Golden Triangle of North Central Montana! Call Jolene to chat about the AgriTech Park and our business attraction strategies, 406.750.4481. 9) Are you a woman looking for a job that can turn into a full career with great pay and benefits? We want to help connect you to the businesses and resources that can make that a reality! In partnership with area businesses and resources, we are hosting a Jobs Initiative Career Day for women interested in somewhat non-traditional jobs – IT, architects/engineering, construction, plumbing, electricians, steel fabrication/fitting, and more! Click here to learn more and to register. Questions? Call Jolene 406.750.4481. 10) We launched our 2019 Business Education Calendar by hosting a webinar called Marketing Essentials: Getting Found Online. This was our 14th webinar to date and saw our largest live attendance thus far. To view any of our webinars, click here. Our first pre-business workshop of the 2019 helped us break-in the large conference room in our new office space. Ten aspiring entrepreneurs from throughout north central Montana attended. We are hosting a private session of our cash flow workshop, Profit Mastery, this week. Up next are two pre-business workshops, The LaunchPoint on February 5th and Boots to Business at Malmstrom on February 6-7th.Contact Jason for more at JNitschke@GFdevelopment.org or check out our 2019 Business Education Calendar. 11) Lillian facilitated the 2019 Brownfields Assessment Grant Advisory Committee kick-off meeting. Six applications for Phase 1s and Phase 2s were reviewed and have been approved. We are looking forward to moving these funds into great potential redevelopment projects. If you have a site that needs assessment, contact Lillian Sunwall at (406) 750-1253 or LSunwall@GFdevelopment.org to see how we can assist you moving your project forward. 12) I networked at the Montana Chamber Business Days at the Capitol. Lillian went to Helena to testify in support of HB53 revising the Big Sky Economic Development Program by expanding the eligible applicant pool and increasing the funding limits for each job created. We’ll be exhibiting tomorrow in the Capitol Rotunda for Economic Development Day. 14) 2019 is going to be a fun year. I’ve been named chair of the International Economic Development Council’s Economic Development Research Partners. GFDA supports this effort that has produced dozens of useful papers on leading edge economic development. I’ll be speaking at IEDC’s Leadership Summit later this month and at the annual Alberta Economic Development Conference in Banff in April. I’ve rejoined the Great Falls Chamber Board, representing GFDA. And, I’ll be giving the local perspective at the Bureau of Business Economic’s annual Economic Outlook on Wednesday, January 30, 8:00 AM at the Hilton Garden Inn. Be sure to register now because this event usually sells out in Great Falls. Here is our special Top 10 to kick off the new year, 5 predictions of what is going to happen in 2019 and 5 resolutions for our economic development work. 1) Exciting new business openings and real estate developments in downtown Great Falls and along our urban riverfront will increase this year. 2) Great Falls and our rural trade area will see a surge of entrepreneurial startups and business expansions. 3) Manufacturing, particularly in agri-processing and energy, will further expand this year, creating opportunities across the region. 4) Commercial investment, filling vacant spaces and new construction, will continue apace across Great Falls. Tourism will continue to expand. 5) Significant progress will be made on key community improvements that make us more and more competitive for attracting investment and talent. 1) Let Great Falls be Great Falls. Our wonderful city was founded as an industrial hub and service center for a large agricultural region. Along the way we were lucky to become a proud Air Force town, and develop into a center for the arts and a basecamp for tourism and recreation. A number of companies found that we are strategically located as a center to serve Montana and the I-15 CanaMex Corridor. Building on these assets — these strengths — attracts private investment that builds our tax base and creates higher wage jobs. 2) Focus on the Doers. We love to work with entrepreneurs, businesses, developers and partners who take action. Doers create the positive actions that grow our economy, improve our competitiveness and create economic opportunity. 3) Put our Entire Team on the Field. Economic development is a team sport. Even the smallest deal involves numerous businesses and agencies. Successful communities understand that the more players working together on your team, the more success you have. 4) Be faster, more creative, more aggressive and more focused. We need to keep beating expectations and raising the bar ever higher. We’re HUNGRY! Results matter! We strive to help our clients and partners to make things happen that otherwise would not. Celebrating their successes, and our community’s and region’s successes, is key to keeping our momentum moving forward. Welcome the rodeo to town at the free Rodeo Mixer and Cowboy Auction this Thursday, January 10th, 5 PM at the Heritage Inn, celebrating the 40th Montana PRCA Circuit Finals. Ignite Great Falls 2019 will be this Friday, January 11, 7:30-10:30 AM at the Meadowlark Country Club. Ignite Great Falls 2019 is an excellent opportunity to gain insight on the year ahead. The format is simple and quick – five minute presentations on business startups, business expansions, real estate developments and institutional capital projects that will either start or open in 2019. Due to limited seating, registration is required. Register for Ignite here. Spread the word! Great Falls Tourism has a new position opening for a Content & Social Media Director. Let’s work together to make 2019 the best year ever for Great Falls and our entire Golden Triangle trade area! First economic development organization in the Rocky Mountain West to earn accreditation from the International Economic Development Council. GFDA and High Plains Financial are Equal Opportunity Lenders.